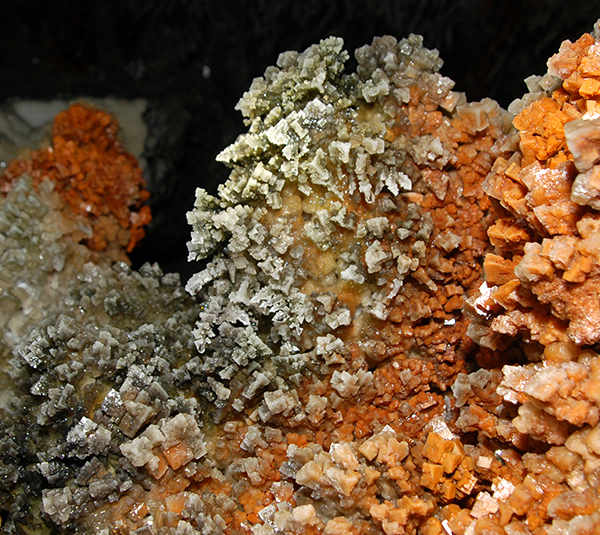 In late 2016 geologists working in Sieroszowice copper-halite mine, while visit one of the old tunnels, discovered very rich and colorful halite mineralization. 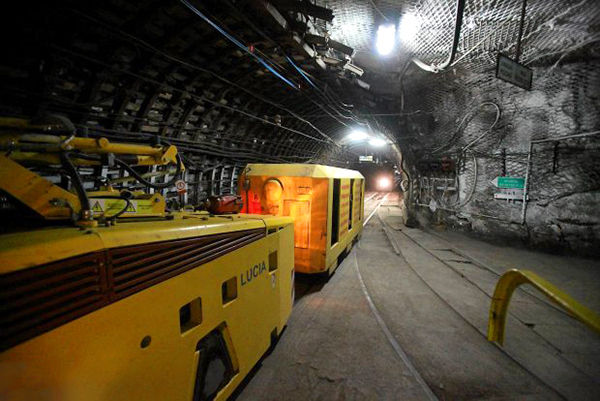 The tunnel was located quite far from the active areas of the mine so it was time-consuming and difficult to reach. 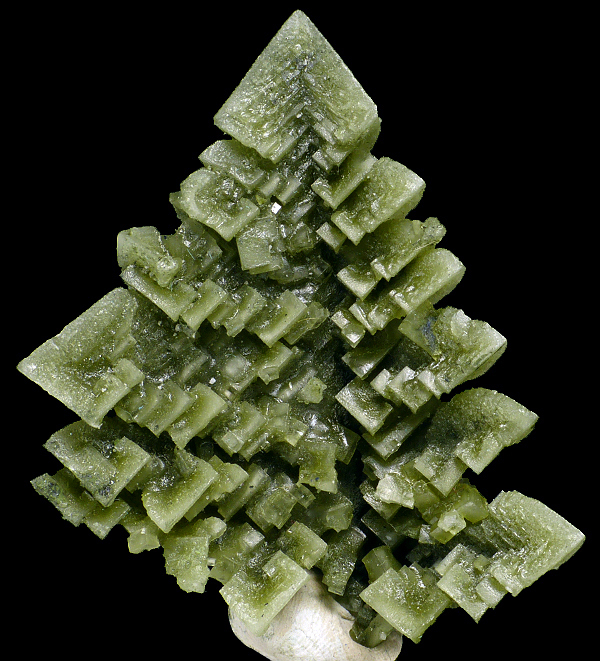 In the course of several visits geologists were able to collect a few hundred unusual green skeletal halite crystals in spectacular forms. 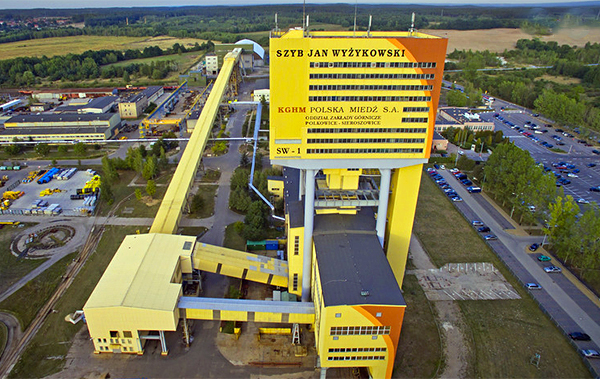 The Lubin area (SW Poland) is famous for one of the world’s biggest copper (6th largest producer) and silver (2nd largest producer!) deposits. The deposit is known as Legnica-Głogów Copper District (LGOM) mining kupferschiefer – copper shales. 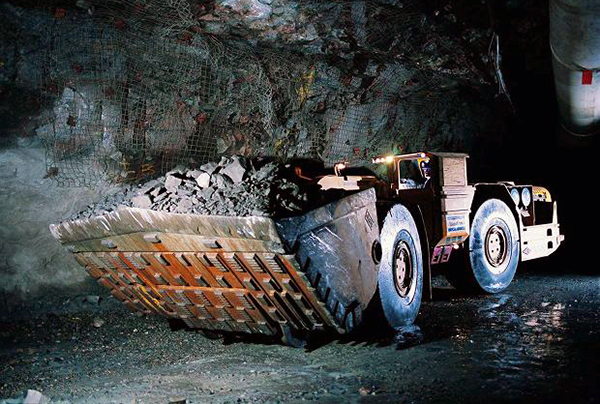 There are over 20,000 miners employed in 3 enormous mines. The average depth of workings is about 1000 m (it varies from 400 m to 1200 m). Several years ago, the total length of tunnels reached over 10,000 km. 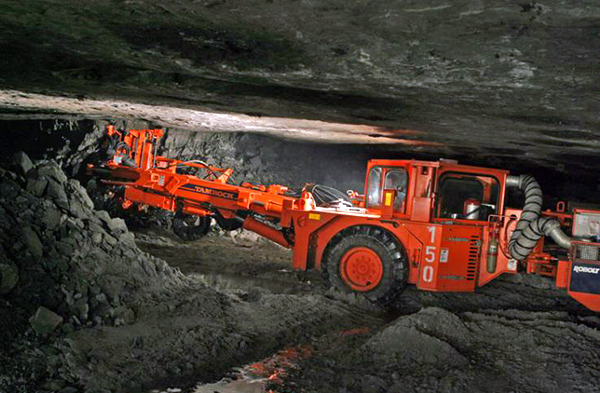 All mines are operated by a huge national company KGHM Polska Miedź. Formation of the copper, silver and halite deposits mined in this area is connected with deposition in a late Permian sedimentary basin. 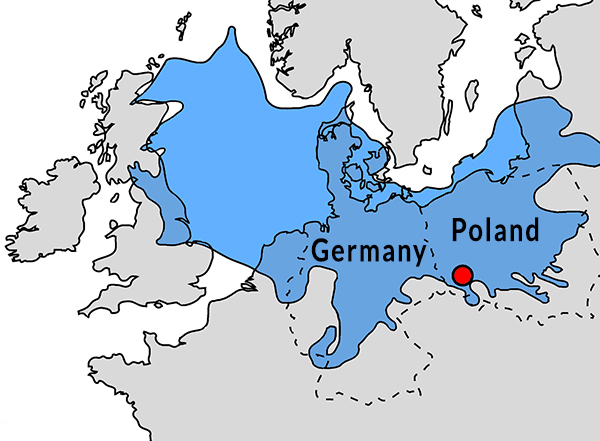 At this time part of what is today Europe was covered by relatively shallow epicratonic sea known as Zechstein Sea. Fluctuations of its depth, resulted in several evaporitic events. 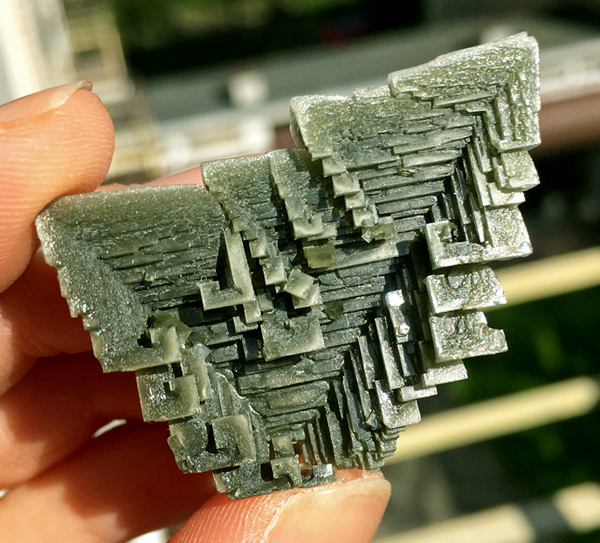 During those events, deposits of halite and black shale (rich in copper, silver and platinum group elements) were formed in cyclic sequences, known as cyclothemes. The most important ore minerals occur as micro-grains and are visible only under the microscope. 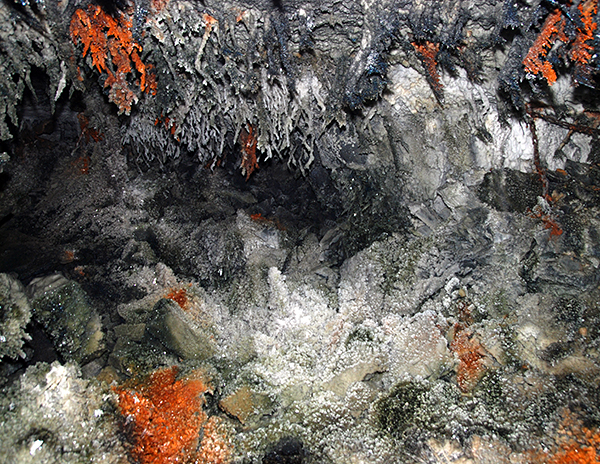 Halite, in contrast to the ore minerals, forms layers reaching up to 160 m of thickness! 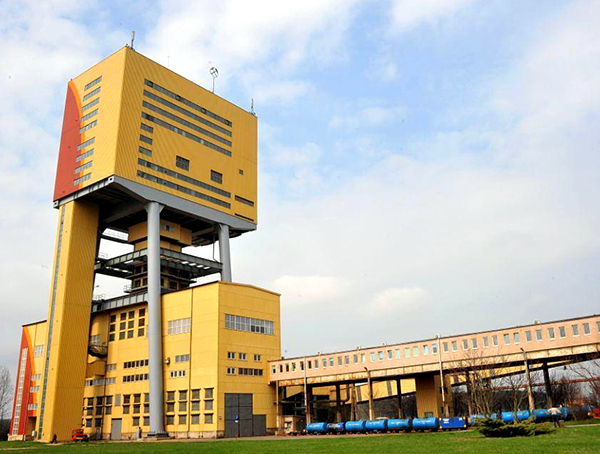 In the Sieroszowice mine both deposits – halite and kupferschiefer – are mined. Halite rich layers are located about 80 m above the copper black shales. 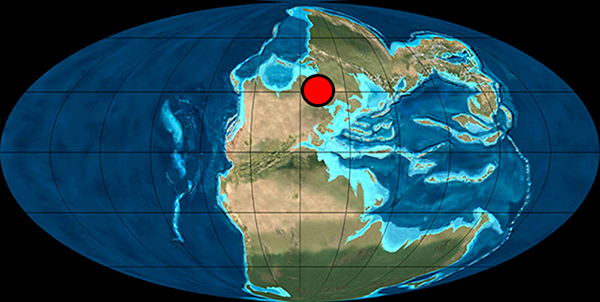 Reconstruction of geography of Earth in Late Permian (255 Mya) with marked location of the Zechstein sea. 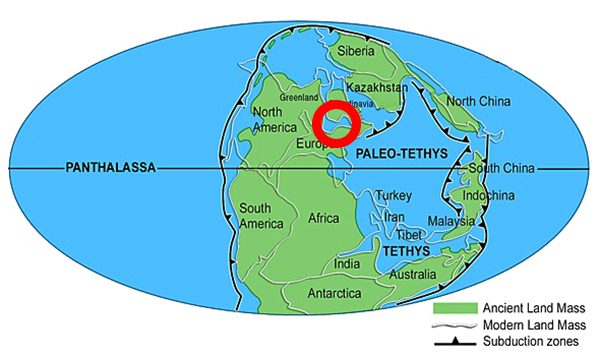 Reconstruction of geography of Earth in Late Permian (255 Mya) with marked location of the Zechstein sea. Recent geographical unites are shown. Zechstein Sea (blue) on map of recent Europe, with marked Legnica-Głogów Copper District. 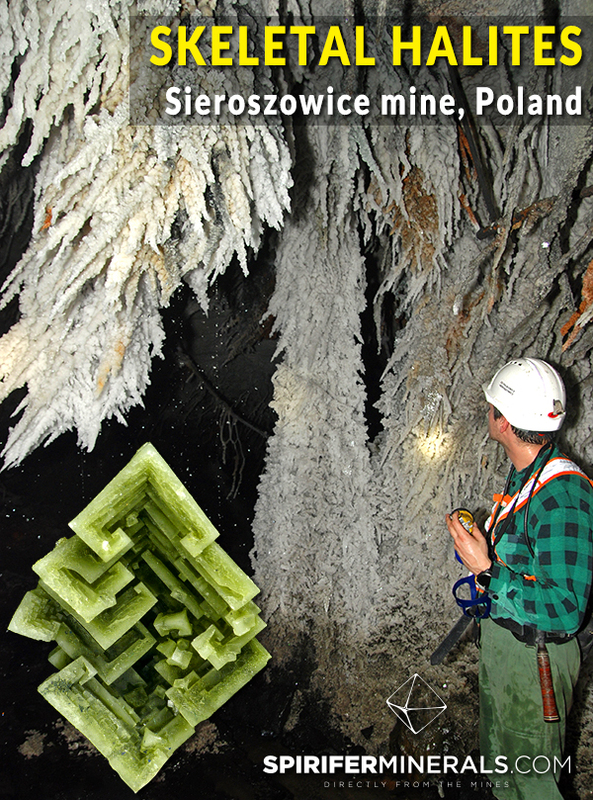 In late 2016 – in the ZG "Polkowice-Sieroszowice" in Kazimierzów – an interesting area with skeletal and stalactitic halites was discovered. 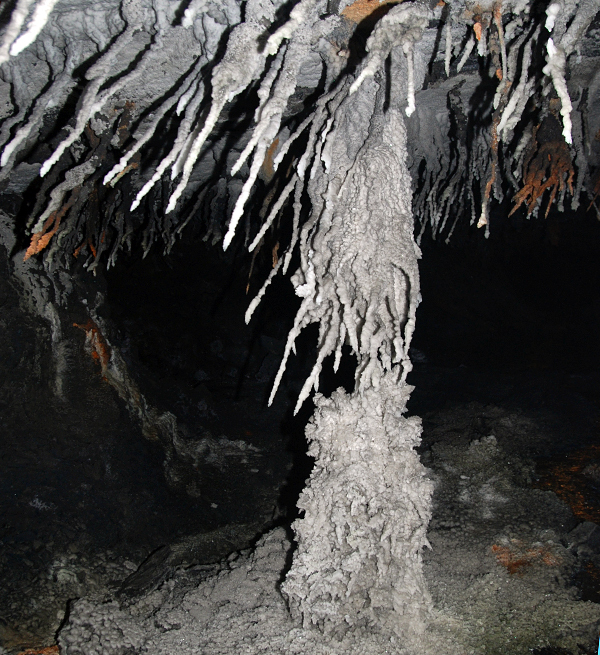 Mineralization is located in an old tunnel mined in the kupferschiefer level, where saline water is dripping from the ceiling. The saline water was probably formed as circulating ground waters leached halite from layers located 80 m above. Copper from the kupferschiefer and iron from mining hardware are the source of the halites` color. 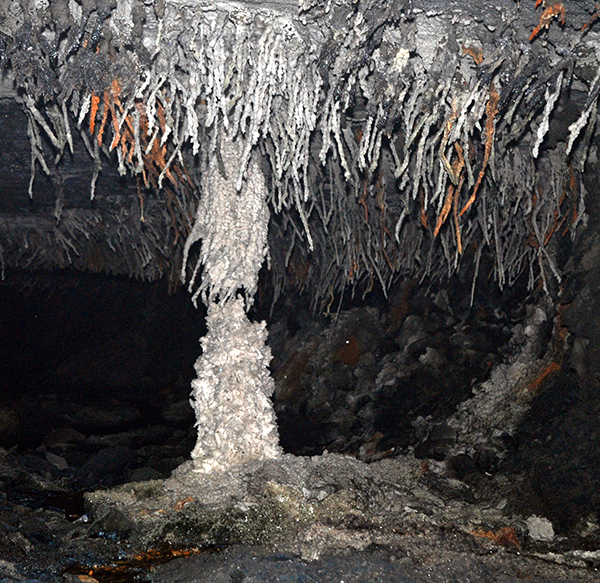 The 320 m long tunnel was abandoned in July 2016 and it seems that halite skeletal crystals, as well as stalactitic forms, grew in only a few months period. Mining in the area will restart around September 2017, and will result in destruction of the newly formed halite deposits. Map of Lubin area showing depth of the copper deposit (red lines), main mining leases and shafts. 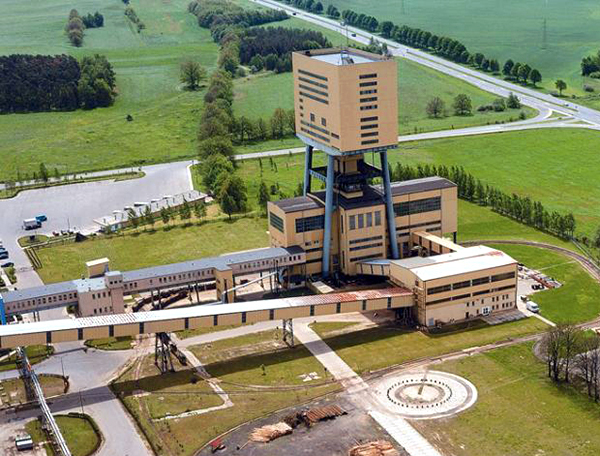 Main shaft in Sieroszowice is marked by a bigger symbol. View to the main shaft in Sieroszowice, copper deposit is on the depth of about 1000 m.
Underground train in Sieroszowice mine. 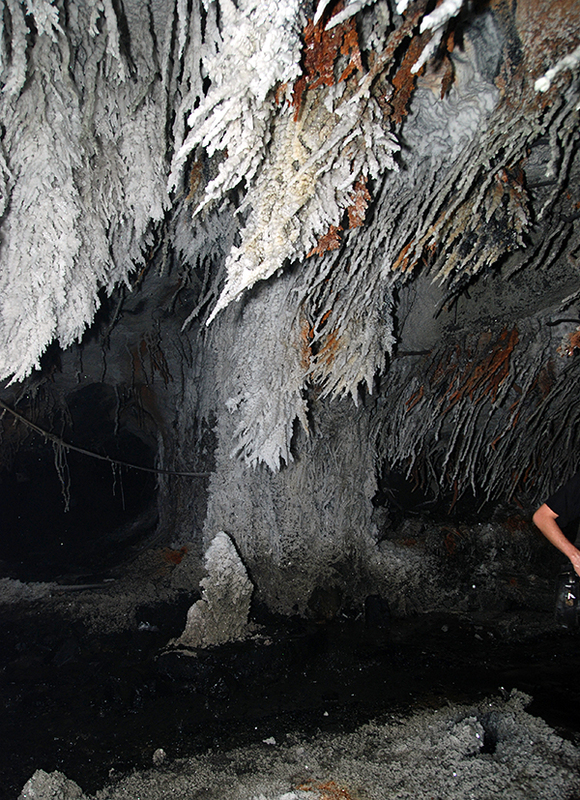 In the old tunnel at the length of 150 m halite grows from saline rich water dripping from the ceiling, where mostly stalactitic forms are present, reaching from a few tens of cm to over a meter in length. 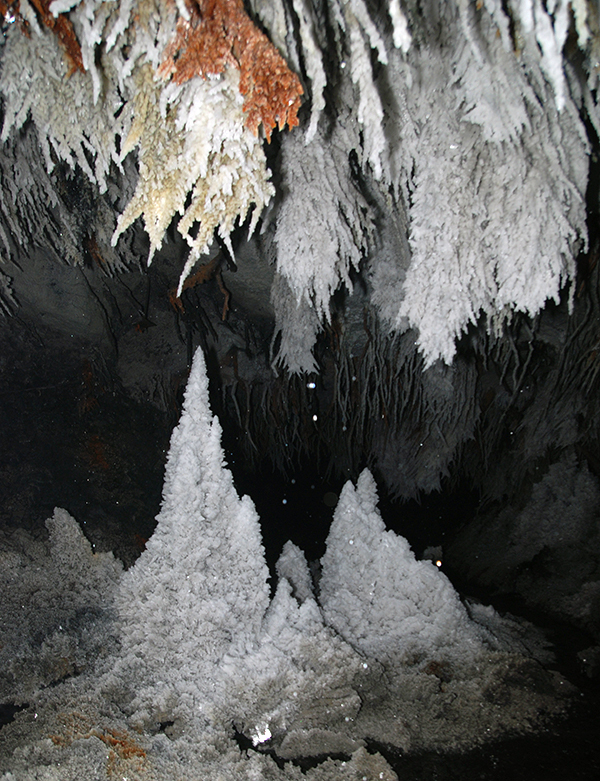 Initial growth of the stalactites occurred vertically, and then at some point in their formation they became “bent” with further growth in a direction oblique to the vertical but all in the same direction, forming typical helicities. This change in growth direction probably started when one of the mine dams was opened and started a strong flow of air in the tunnel. 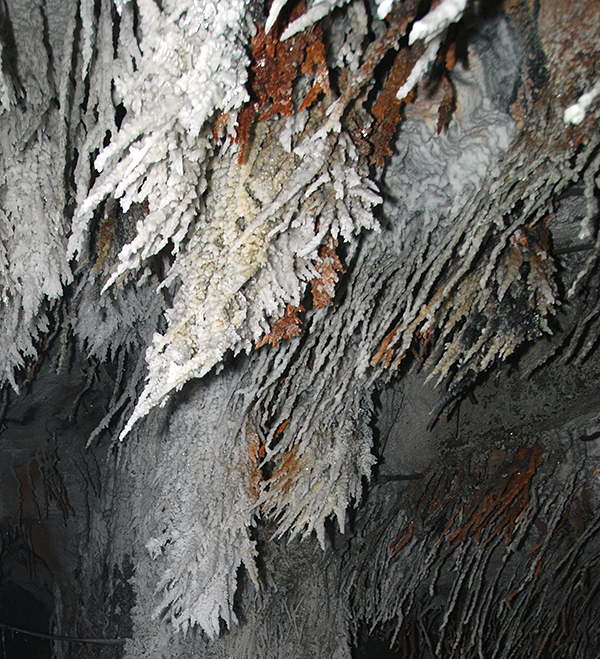 Huge halite stalactites growing on celing from dripping saline-rich water. 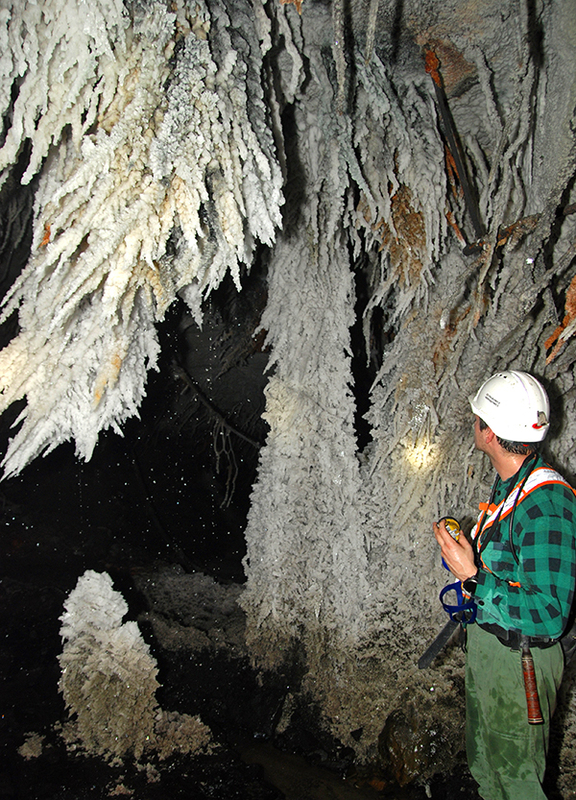 Huge halite stalactites and stalagmites growing. Huge halite helictites growing on celing from dripping saline-rich water. Huge halite stalactites and stalagmites. 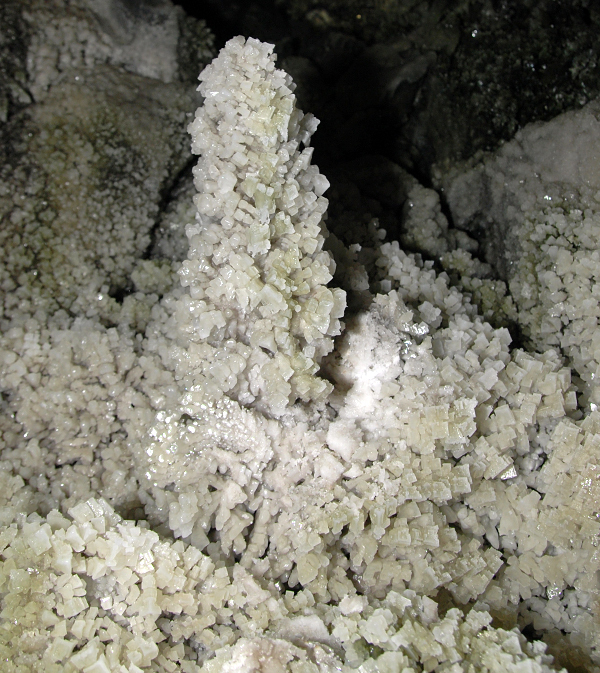 Huge halite stalactites/helictatites and stalagmites. 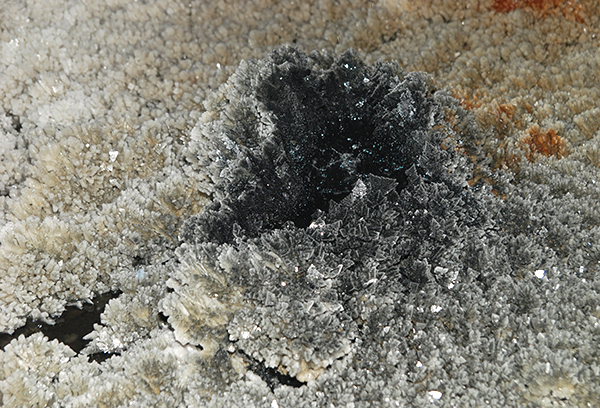 On the tunnel floor crystallization habits are much more diverse. 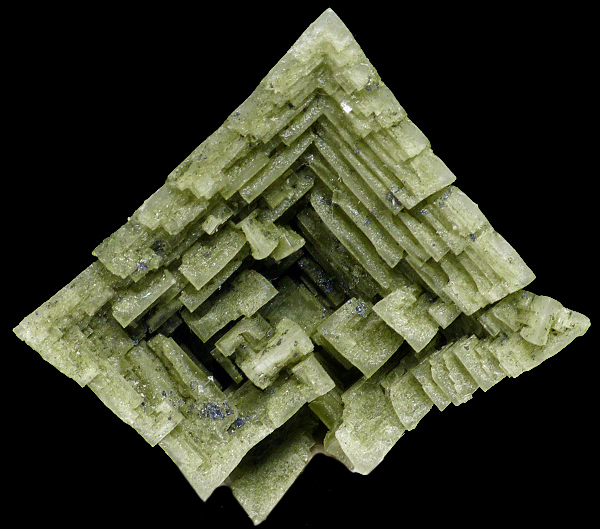 Depending on local conditions halite grew as stalagmites, cubic crystals or skeletal crystals. Their colors depend on the level of water flow and presence of the coloring elements and vary from white (most common), thorough grey, black, green and red. According to electron microscope and XRD analyzes the most common inclusions in the halite are calcite/aragonite, covellite, sulphur (sic!) and tolbachite (first time described for the location). Substantial quantities of organic materials (bitumens) are also present. Most probably the green to black colors are the result of different ratios of inclusions such as tolbachite, sulphur, covellite and bitumens. The green color is found only in the small areas where water drips in large volumes from the ceiling. In these spots on the floor small “ponds” are present with much higher water flow than at other places. It looks like the growth of copper secondary minerals needs a higher water flow. This was previously described in botallackite/paratacamaite/atacamite occurrence in the same mine – see article here. Red to brown halites are colored by the rust coming from the mining hardware such as nails, ground supports and this color shows up only very locally next to steel objects. Colorful halite crystals growing in an old tunnel. 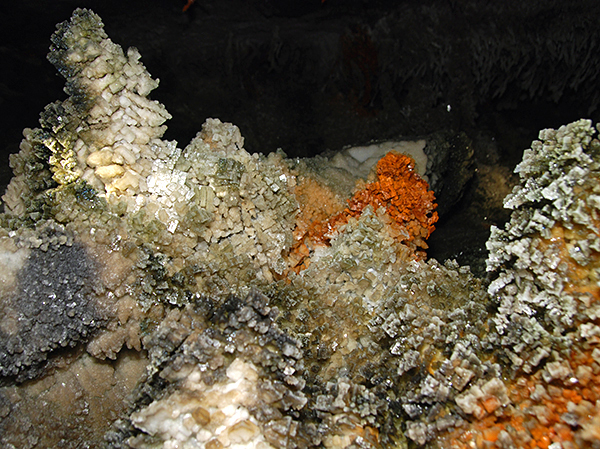 Red color is caused by inclusions of the iron oxides coming from weathered mine hardware. Green color in places where water flow level is higher is caused by presence of tolbachite. 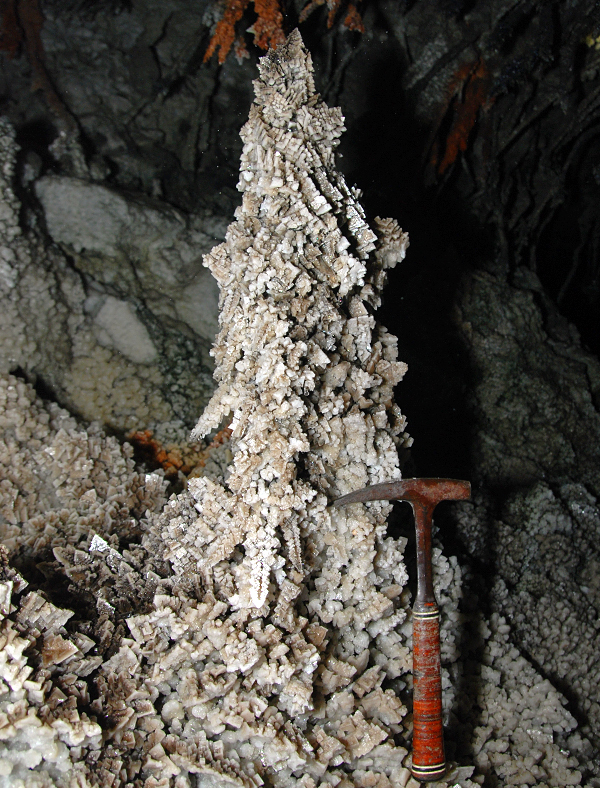 Big stalagmite partly built by white skeletal halite crystals. 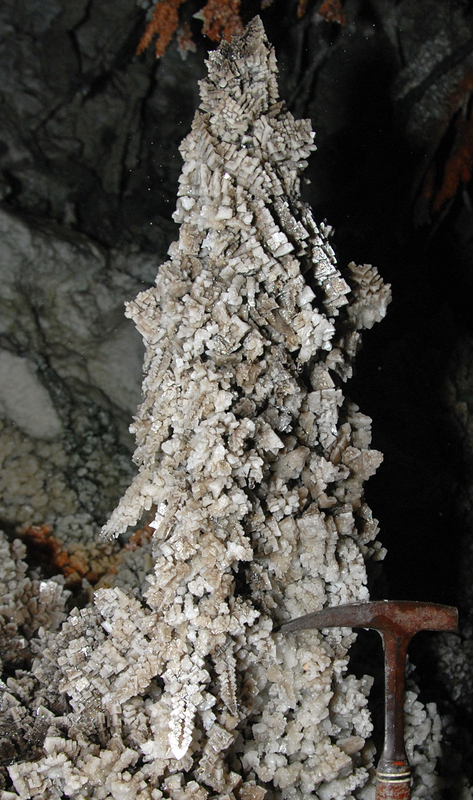 Stalagmite built by white skeletal halite crystals. 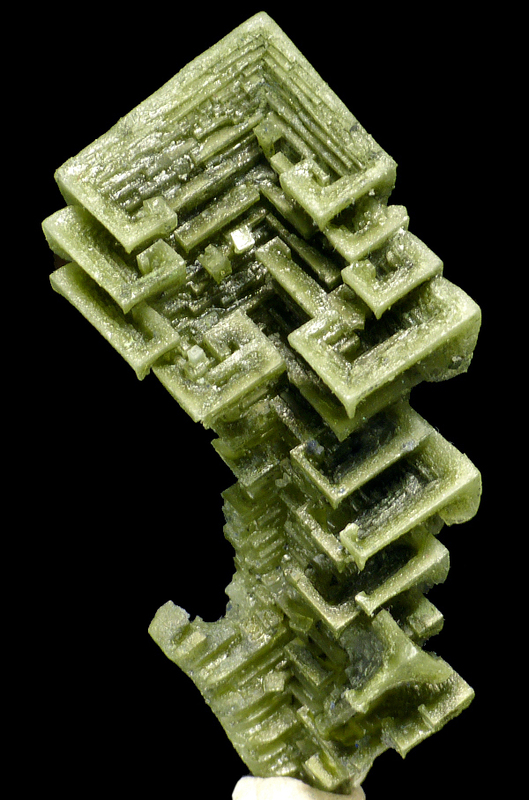 The best specimens of sharp and lustrous skeletal green crystals grew only around small puddles. Usually a darker color is present closer to the center grades to white moving outside of the water dripping zone. 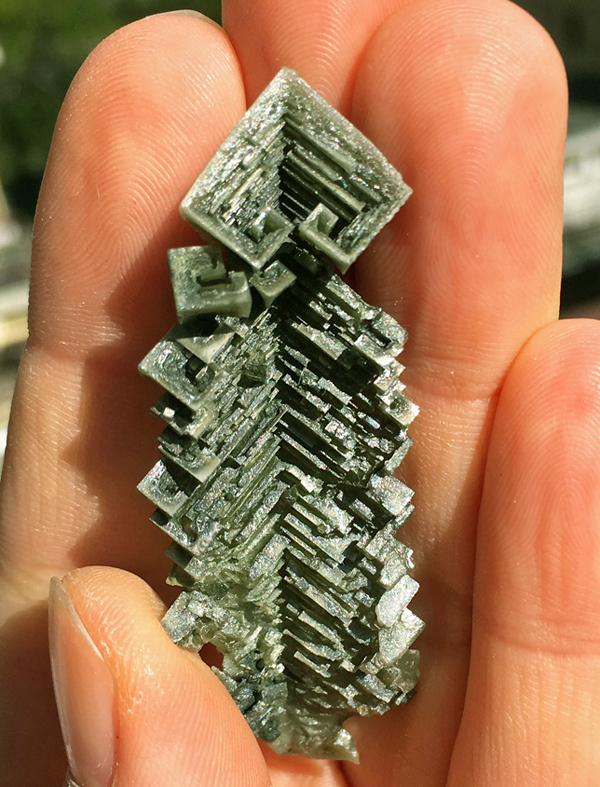 The best crystals reach up to 12 cm and have superb architecture with very well developed geometric skeletal growth. The skeletal forms are an effect of a very fast growth of the crystals. Small pond surrounded by skeletal green halite crystals. 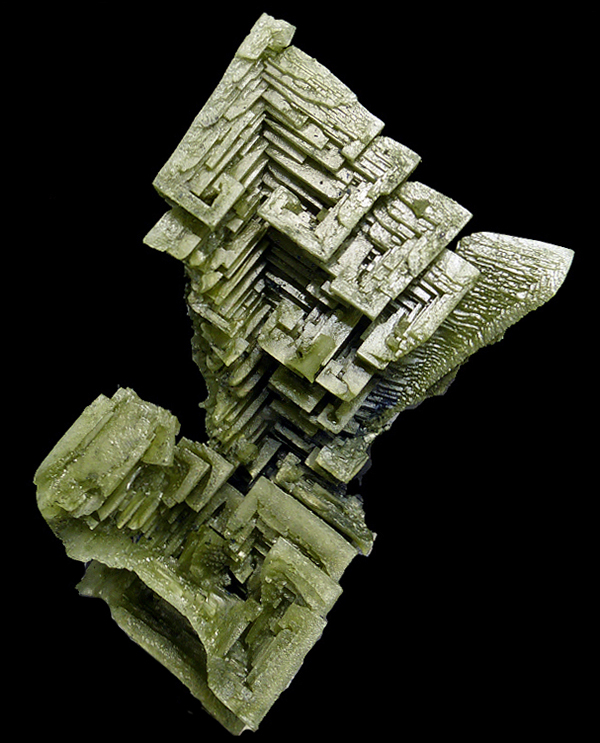 Tolbachite, which presence is a source of green color, grows in places where water flow is quite high. 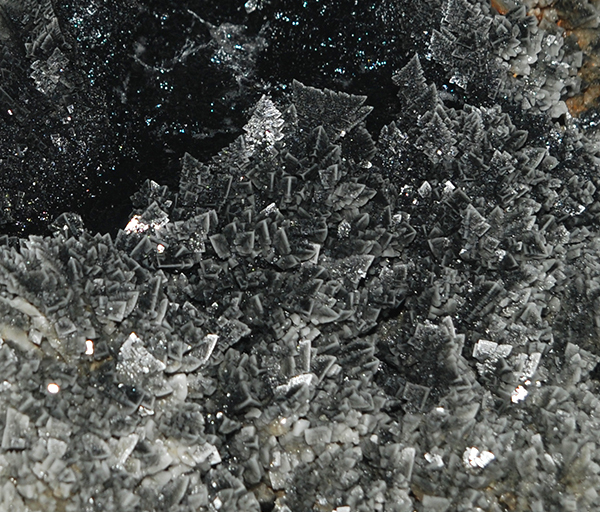 Details of the small pond with green skeletal halite crystals. There are several different morphotypes of the skeletal crystals but all are based on the simple cubic crystals. The morphologies vary from classic skeletal crystals, where all four edges of the cube grow in the same ratio, to very flattened forms in which only one edge grew fast. All kinds of intermediate forms are also present. It is quite common that bigger crystals have much deeper color in older (lower) parts of the crystals, and upper, younger parts became to be lighter in color, and even white in some cases. 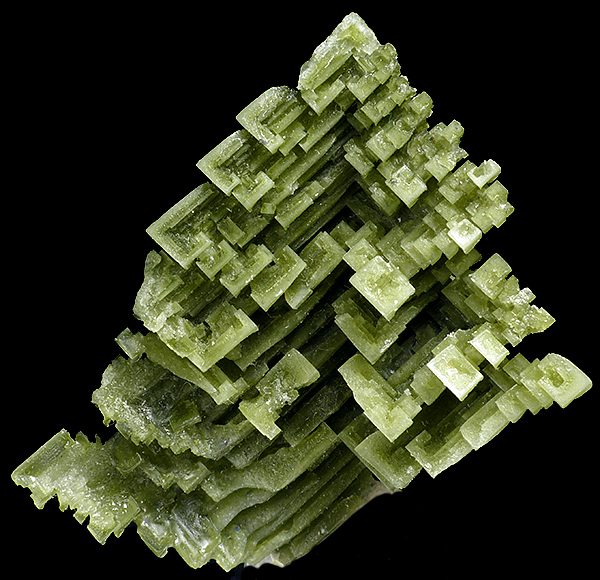 Total production of the good quality specimens of skeletal green halites is about 200-300 specimens. Most of them are in size range of about 2-4 cm, and only small percentage of good quality crystals reaches over 5 cm. According to the estimated growth time, it seems that about 500 specimens may be collectable before the tunnel gets destroyed. 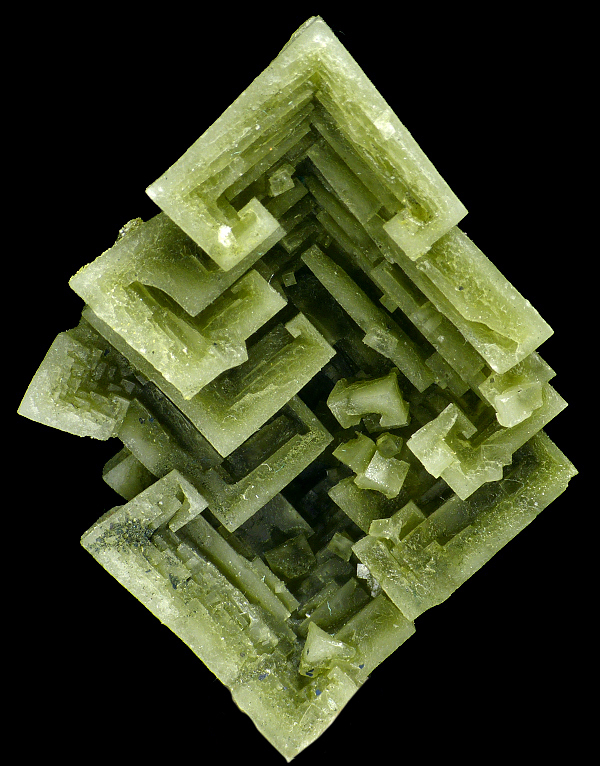 Skeletal halite crystal from Sieroszowice mine. Size 3.5 cm. Photo M. Wikiera. Spirifer Minerals specimen. 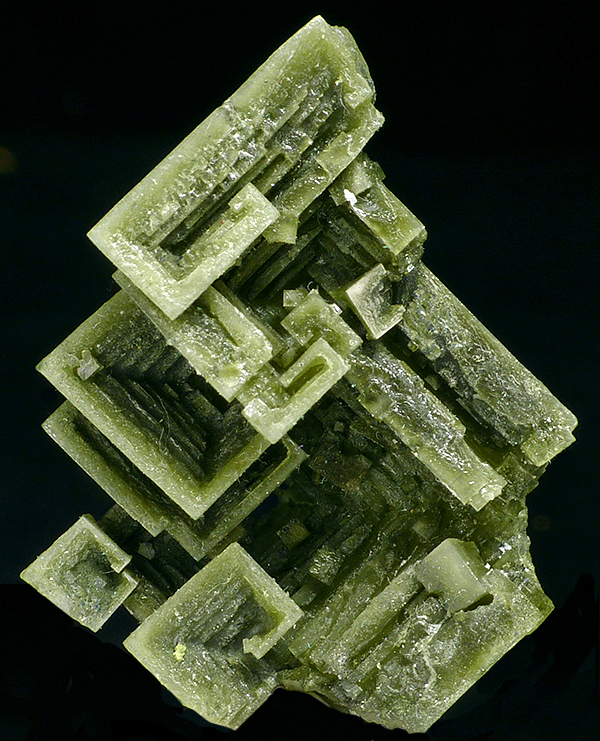 Skeletal halite crystal from Sieroszowice mine. Size 11 cm. Photo M. Wikiera. 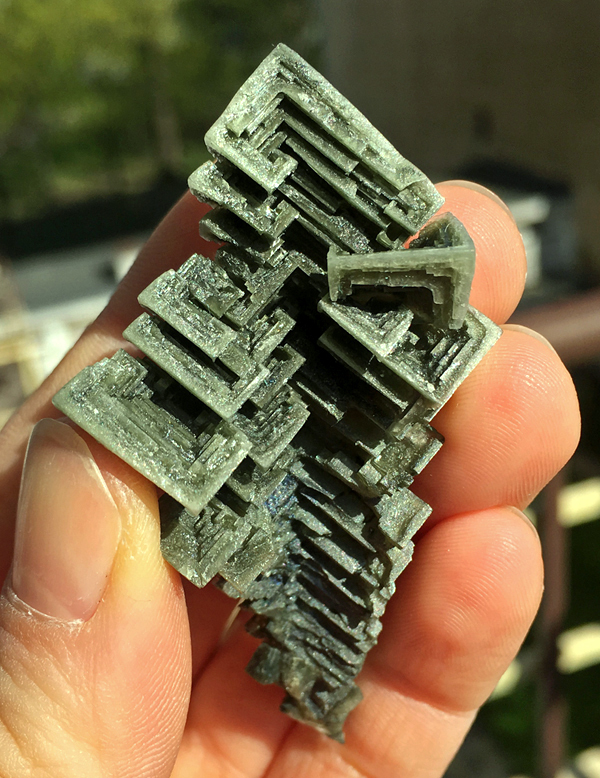 Spirifer Minerals specimen. 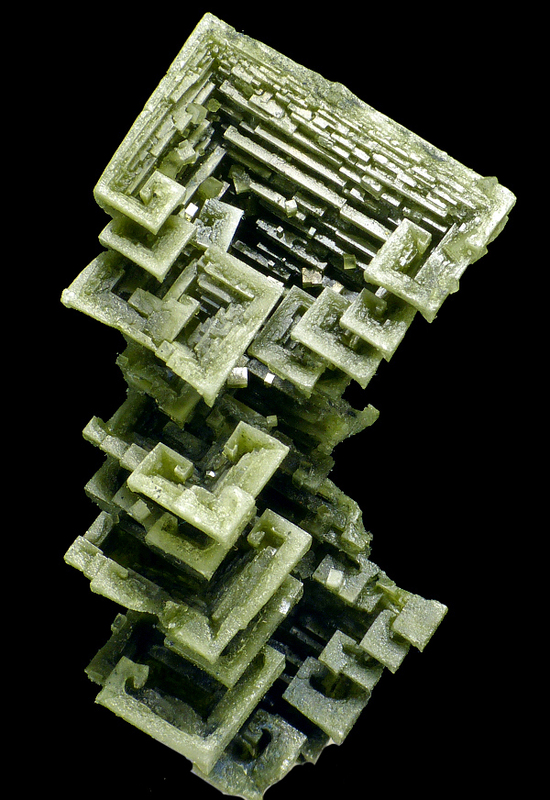 Skeletal halite crystal from Sieroszowice mine. Size 8.5 cm. Photo M. Wikiera. Spirifer Minerals specimen. 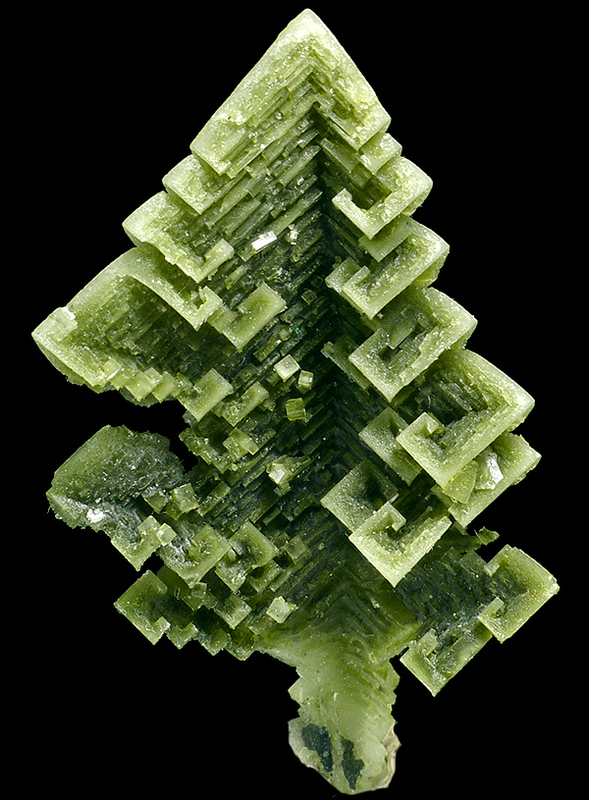 Skeletal halite crystal from Sieroszowice mine. Size 4.5 cm. Photo M. Wikiera. 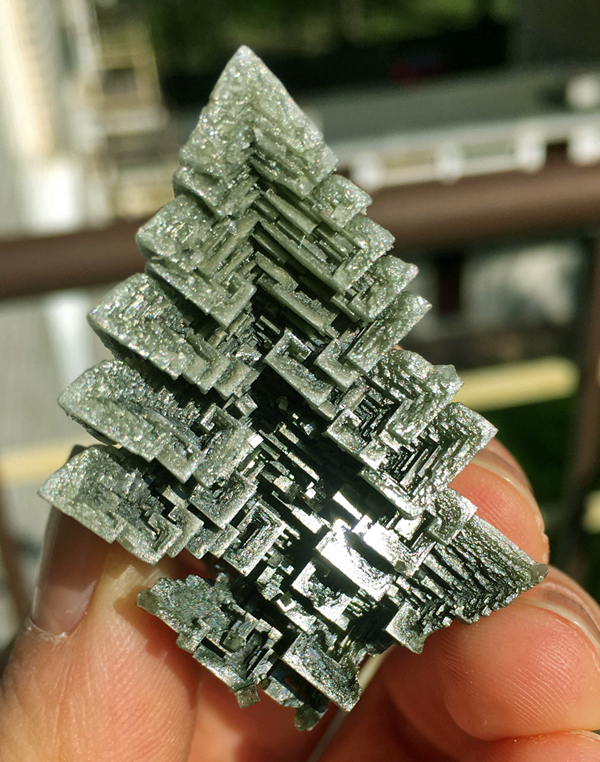 Spirifer Minerals specimen. 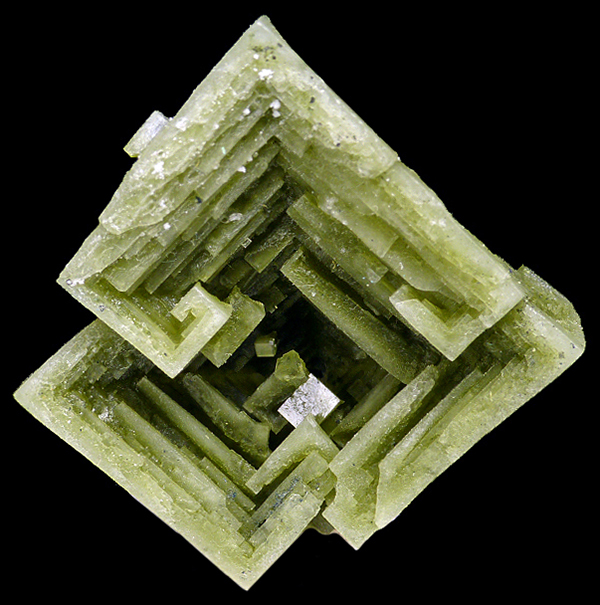 Skeletal halite crystal from Sieroszowice mine. Size 5 cm. Photo M. Wikiera. 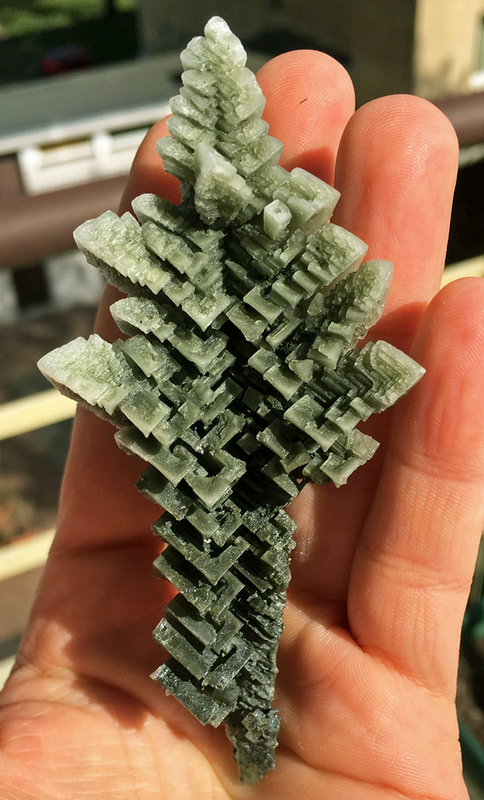 Spirifer Minerals specimen. 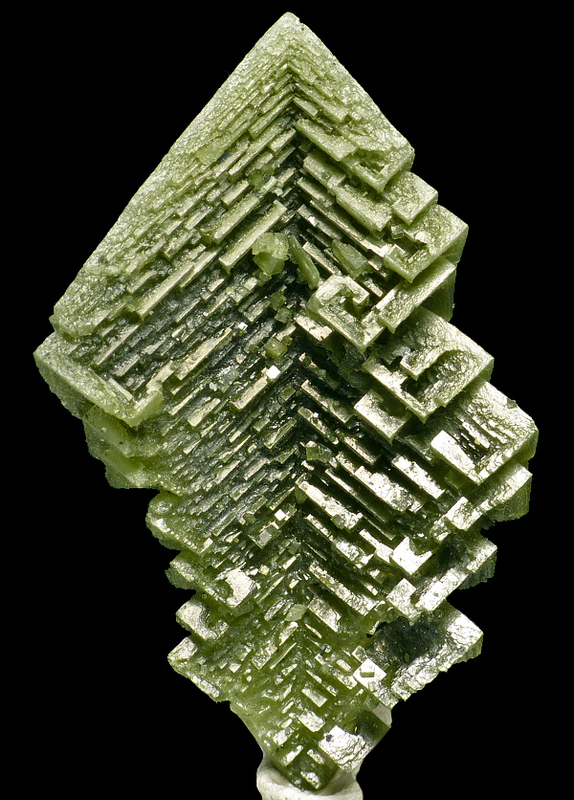 Skeletal halite crystal from Sieroszowice mine. Size 5.5 cm. Photo M. Wikiera. Spirifer Minerals specimen. 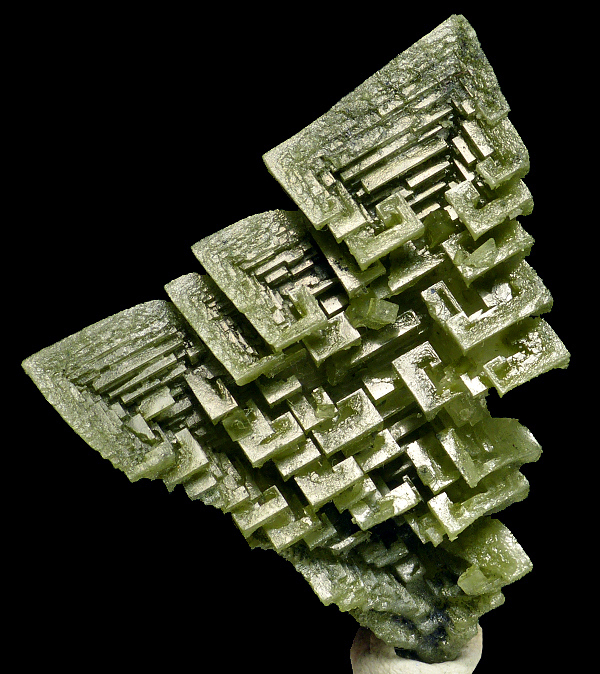 Skeletal halite crystal from Sieroszowice mine. Size 6 cm. Photo M. Wikiera. Spirifer Minerals specimen. 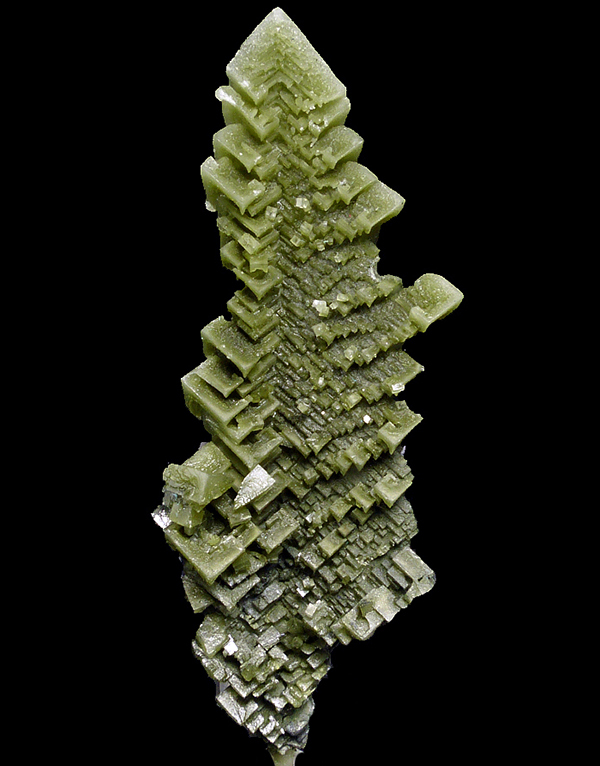 Skeletal halite crystal from Sieroszowice mine. Size 10 cm. Spirifer Minerals specimen. Skeletal halite crystal from Sieroszowice mine. Size 5 cm. Spirifer Minerals specimen. Skeletal halite crystal from Sieroszowice mine. Size 6 cm. 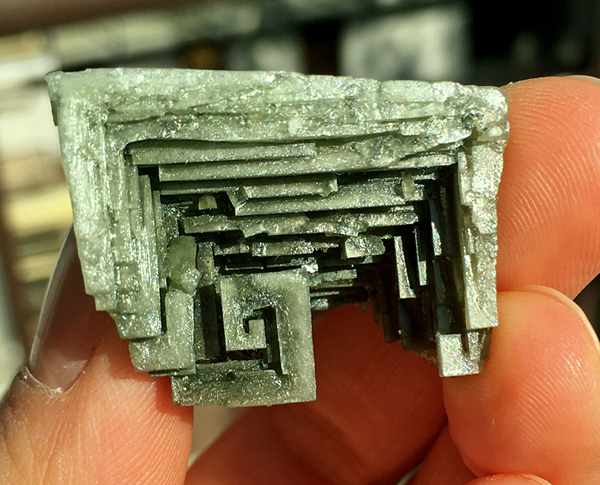 Spirifer Minerals specimen. Skeletal halite crystal from Sieroszowice mine. Size 3.5 cm. Spirifer Minerals specimen. 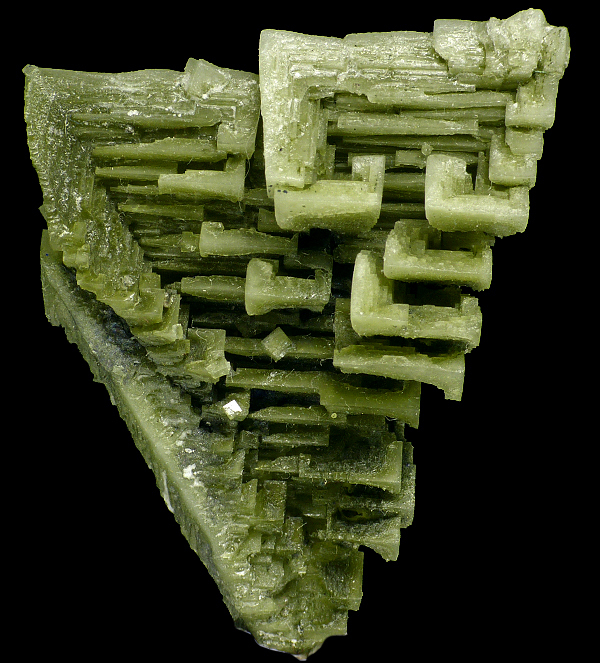 Skeletal halite crystal from Sieroszowice mine. Size 6.5 cm. 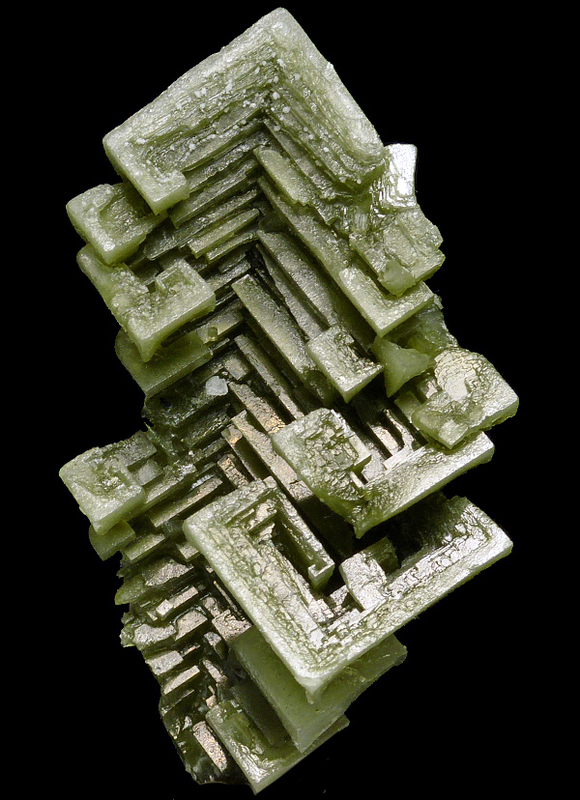 Spirifer Minerals specimen. 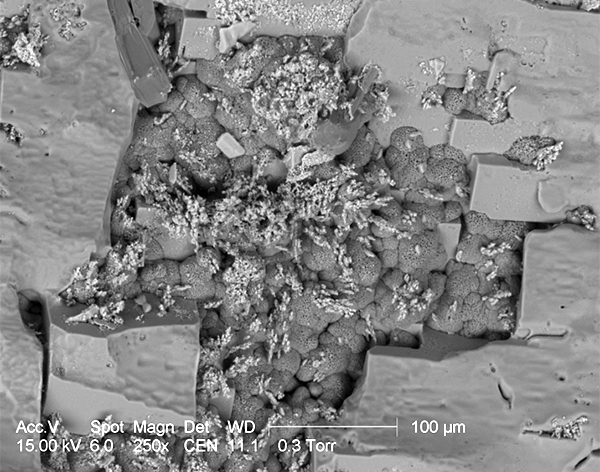 Micro crystals of sulphur on aragonite, bar is 100 micrometres whats equals to 0.1 mm. Photo from an electron microscope.